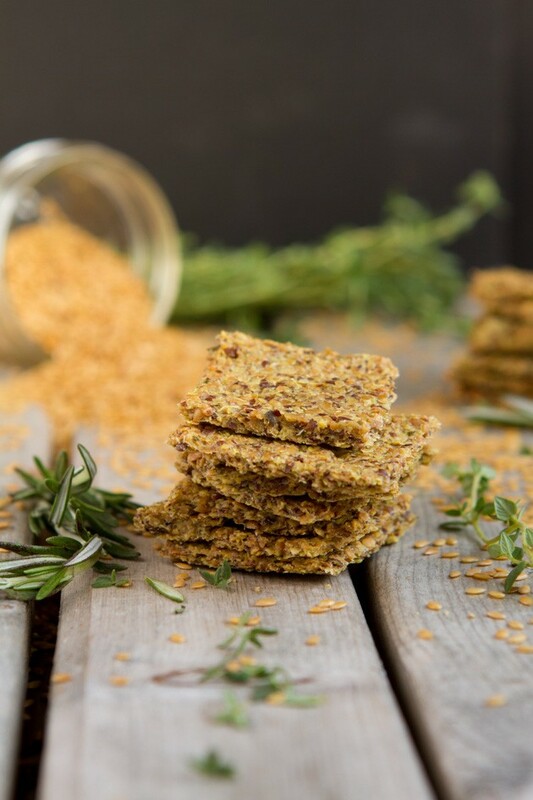 Crunchy, grain-free flax crackers made with ground flax seed, celery and fresh herbs. Baked in the oven until crisp. Preheat oven to 225F and cover two large baking sheets with parchment paper or a silicone baking sheet. Set aside. Place celery, oil, vinegar, herbs and salt in the bowl of your food processor. Pulse until celery is completely pureed. Add ground flax and pulse just until combined. Let sit for 2 minutes to firm up. Plop half of the dough onto your prepared baking sheet, smoothing out with the back of a spoon until it covers the entire baking sheet. You want the crackers to be about ¼-inch thick. Once complete, repeat with remaining dough on the other baking sheet. Then, run a knife along the sheets, scoring squares in the dough. Bake for 2 hours, flipping halfway through and removing the parchment paper. The baking time will vary greatly on how thick/thin you make the crackers. You want the end result to be crisp, crunchy with no moisture left. Remove from the oven and allow to cool on the baking sheet for 15 minutes. Makes 75 crackers, 5 crackers per serving. Flax Seed: If you’re wanting to use a combination of seeds in this recipe, I’m sure you could. Perhaps half hemp seeds? Sunflower seeds? Celery: I imagine that zucchini would work, too. Avocado Oil: any oil would work here, whatever you’d like to use. 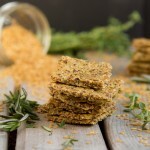 Dehydrator: If you would like to keep this recipe raw, you could dehydrate the crackers. The reason I didn’t do this for this recipe is because not everyone has a dehydrator and I want to make Healthful Pursuit recipes as accessible to people as possible. I’ve had this dehydrator since 2007 and love it. Food Processor: If you do not have a food processor, you could try using your blender! The key is making the celery paste. If using a blender, make the celery mixture, transfer to a bowl, then add the flax seed and mix with your hands or a large spoon. I’ve had this food processor since 2010 and use it all the time!